Saturday’s match was a rollercoaster of highs and lows, but ultimately led to a loss for the Blackhawks. 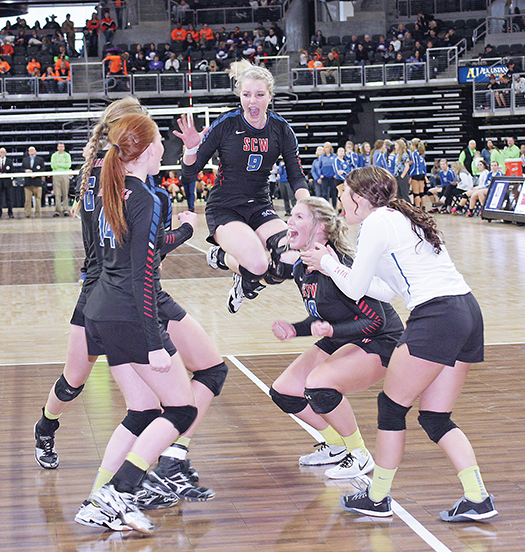 Topping off a wildly successful fall sports season, the Sanborn Central/Woonsocket Lady Blackhawks volleyball team exceeded the expectations of critics to bring the sixth place trophy home from the Class B State Volleyball Tournament this past weekend. The Blackhawks went into the tournament labeled the resident underdog with eighth place seeding. The girls decided not to let that bother them, however, shrugging off the naysayers, to come within an inch of the consolation championship. Inevitably, SCW met a tough team from Chester for their first contest of the tournament, which was held this past weekend at the Denny Sanford Premier Center in Sioux Falls. Chester Area, which went on to win first place, took an easy win in the first round, 3-0, over SCW. Set scores for the first contest were 25-14, 25-17 and 25-18. Myah Selland led with 12 of her team’s 23 total kills. Tayla Weber added six kills and a block. Bailey Moody had 15 of a total 20 assists and eight digs, while McKenzy Peterson had 12 digs. Maddie Vermeulen added on seven digs and Tessa Jensen had six digs and two kills. The first snowstorm of the year Friday also brought on a flurry of Myah Selland in the faces of the Philip Scotties, as she put down 27 kills to haul her team to a decisive 3-0 win. The attention-grabbing win over the fifth-seeded team had set scores of 25-15, 25-16 and 25-14. Selland also got four blocks in the win. Weber helped out with four kills, 10 digs and an ace. Vermeulen had three kills and four aces, along with eight digs. Moody assisted her teammates 26 times and had 10 digs. Kayla Olson had 12 digs and two assists and Peterson got 10 digs as well. The win over the 25-7 Scotties moved Sanborn Central/Woonsocket to 16-11 and the Class B Consolation Championship Saturday morning. Starting out as the eighth seed in any tournament and making it into the consolation championship is no simple feat, yet the Lady Blackhawks, with nothing to lose, left no doubt that they deserved at least a shot at fifth place. The Hawks were matched up with 25-7, sixth seeded Platte-Geddes in the late morning battle, and weren’t about to roll over and give it away. Still, it didn’t look good early on when the Black Panthers took a big early lead in the opening set, and it looked worse yet, when the Hawks found themselves down the first two sets. P-G looked to run away with it, going up by as much as 11 in the first match, yet SCW fought back to tie it up at 24. The ball bounced in the Panthers’ direction as they took number one, 26-25, but it was evident that the Hawks had come to play. The Blackhawks put their toes to the line after a rough second set loss and came back with a vengeance to win the third set, 25-21, and force the match into a fourth round. Selland came alive in the third, pounding the Black Panthers into a 25-21 submission and forcing a fifth set. The drama, ever-present throughout the match, multiplied in set five. Parents and fans chewed their nails as each team took turns scoring, getting ahead, then falling behind; a ping-pong between a one or two point deficit or lead. The set ended with P-G up 22-20, the consolation championship within a fingernails reach of the Sanborn County girls. 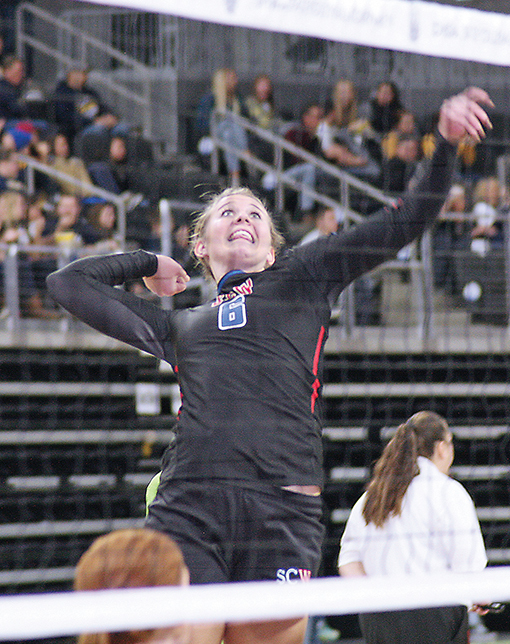 Selland had another huge day with 34 kills, 12 digs and six blocks. Jensen added on seven kills, while Weber had six kills, two assists, 10 digs and one each ace and block. Vermeulen had four kills, two assists, one block and 25 digs. Along with Moody’s two kills, she racked up 30 assists and 16 digs. Olson helped out with 15 digs, while Peterson had 20. The Sanborn Central/Woonsocket girls became the second of the two fall season Blackhawk teams to earn a trip to State and ended their season, 19-12, with a sixth place trophy. 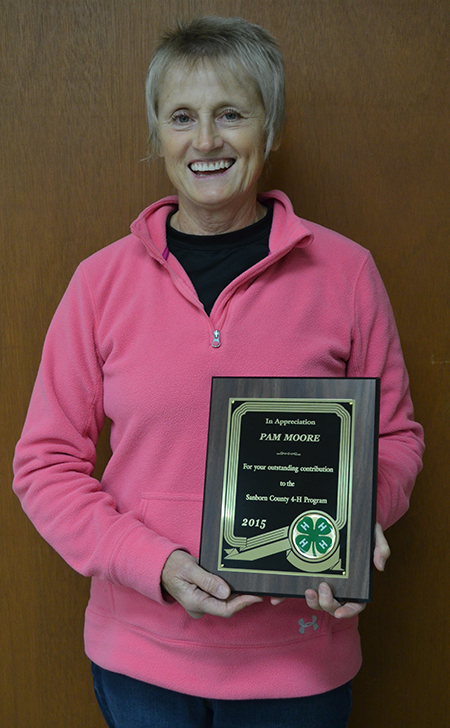 Receiving the Outstanding Contribution to 4-H Award at the 2015 Recognition Event was Pam Moore. Sanborn County 4-H held their annual Recognition Event on Nov. 15 at the 4-H Building in Forestburg. Following are those recognized for their accomplishments. Cloverbuds received a token of rememberance for their year in the pre-4-H program: Miley Adams, Hope Baysinger, Danielle Brooks, Tyson Eddy, Tori Hoffman, Rylee Jennings, Sophie Kelly, Riley Kneen, Sebastian Kotilinek, Trinity Kotilinek, Bryce Larson, London Metzger, Clay Moody, Teagen Moody, Emma Niles, Elisha Schultz, Shiloh Senska, Sutton Senska, Kaitlyn Swenson, McKenzie Uecker, Payton Uecker, Eli White and Cannon Zoss. A 4-H Varsity letter is given to 4-H members who have completed five years: Xavier Baysinger, Taylor Lindsey, Megan Linke, Tater Moody, Collin Schmiedt, Morgan Schmiedt, Riley Schmiedt, Katie Schmit, Cayden Slykhuis, Matthew Terkildsen, Kaylee White, Taryn Ziebart. Project medals went to: Xavier Baysinger, Dilyn Brooks, Bailey Feistner, Ashlee Hanson, Alexis Kelly, Toby Kneen, Aaron Linke, Megan Linke, Emily Ohlrogge, Nick Snedeker and Shaun Snedeker. Shooting Sports Beginner Match awards were given to: Westin Hagman, third; Toby Kneen, third place, first; Brody Miiller, second, fourth, first, third; Emily Ohlrogge: third, first, first. Sanborn County 4-H had 39 participants in 91 events at the SD 4-H State Shoot at the end of April in Pierre/Ft. Pierre. Beginner State Shoot Highlights include: Toby Kneen, RWOS – second, Air Rifle – second; Emily Ohlrogge, Air Pistol Timed – first; Beginner Air Pistol Team – first: Emily Ohlrogge, Blake Howard, Brody Miiller, Toby Kneen. Junior Match awards: Tyler Eddy, first. Junior State Shoot Highlights include: Tyler Eddy – third; Junior Air Rifle Team – second place: Megan Linke, Taylor Lindsey, Tyler Eddy, Kaylee White. Senior Match awards: Austin Ball, third; Jonathan Linke, second, third; 22 Rifle Team – third place: Jonathan Linke, Elliott Ohlrogge, Aaron Linke, Nathan Linke. Senior State Shoot Highlights: Austin Ball, second; Jonathan Linke, third; Elliott Ohlrogge, first; Senior BB Gun Team, first: Jonathan Linke, Elliott Ohlrogge, Austin Ball, Aaron Linke; Senior Air Pistol Team, first: Austin Ball, Jonathan Linke, Elliott Ohlrogge, Nathan Linke. New County records: Beg. BB Gun – Ellie Evans, 338.01 (11 year record); Jr. BB Gun – Taylor Lindsey, 365.10 (broken nine times in two years); Air Pistol Beginner Girls – Emily Ohlrogge, 178.01; Air Pistol Senior Boys – Elliott Ohlrogge, 175.02; Air Rifle Junior Girls – Taylor Lindsey, 216.01; Air Rifle Senior Boys – Jonathan Linke, 263; 22 Pistol Senior Boys – Jonathan Linke, 194. Archery new County records: Toby Kneen – Beg. CWS-R 143.07 and Beg. RWOS 125.06; Brody Miiller – Beg. CWS 126.05 and Beg. CWOS 120.03; Westin Hagman – Beg. CWOS-R 107.04; Tyler Eddy – Jr. CWOS 87.01 and Jr. RWOS 98; Ashleigh Fry – Sr. CWS-89.01; Austin Ball: Sr. CWOS-77; Katelin Deneke – Sr. RWOS-67. Archery also tracks records at the county level for scores shot at the State Shoot. New records are: CWS Beginner – Brody Miiller, 112.03; CWS Senior – Ashleigh Fry, 71.01; CWOS Beginner – Brody Miiller, 102.02; CWOS Junior – Tyler Eddy, 74; CWOS Senior – Austin Ball, 94.01; CWOS-R Beginner – Westin Hagman 94.01; CWOS-R Junior – Tyler Eddy, 112.01; RWOS Beginner – Toby Kneen, 115.05; RWOS Junior – Kenzee Schafer, 88; RWOS Senior – Katelin Deneke, 72. • Madi Moody: reserve champion, Junior Girls Goat Tying; fifth in the second Go for Junior Girls Barrel. • Mason Moody: State Champion in Junior Boys Bull Riding; reserve all-around in the Junior boys division; sixth in the second Go for Junior Boys Breakaway; eighth in the second Go for Junior Boys Flag Race. • Tater Moody: set new arena record in the Junior Boys Flag Race; reserve champion in the event; first in the first Go for Junior Boys Goats. • Bailey Moody: third in the first Go for Senior Girls Pole Bending. All Around Horse Awards: Senior – Morgan Selland; Junior – Mason Moody; Beginner – Delaney Zoss. State 4-H Horse Show: Madi Moody – Junior Pole Bending Reserve Champion; Mason Moody – Junior Pony Pole Bending Grand Champion, Junior Pony Barrel Racing Grand Champion; Morgan Selland – Senior Reining , fifth. Central Electric Coop top electrical project at the Sanborn County Achievement Days: Ellie Evans for her deer lamp. Sanborn County Conservation District project award: Rex Schlicht. Dakotaland Federal Credit Union financial literacy exhibit award: Jonathan Linke for his paper on financial responsibility. The County Sweepstakes Awards: Agriculture: Senior – Nathan Linke and Aaron Linke; Junior – Xavier Baysinger; Beginner – Delaney Zoss; Family and Consumer Science Sweepstakes: Senior – Jonathan Linke; Junior – Alexis Kelly; Beginner – Emily Ohlrogge; Personal Development Sweepstakes: Senior – Catherine Bechen; Junior – Megan Linke; Beginner – Emily Ohlrogge. Top 10 judging teams at State Fair: Beginner Consumer Decision Making Team, first – Blake Howard, Camden Jost, Carver Lindsey, Kade Olinger; Beginner Horticulture Skill-a-thon Team, seventh – Blake Howard, Camden Jost, Carver Lindsey, Emily Ohlrogge. Top 50 individual at State Fair Judging: Beginner CDM: Blake Howard – sixth, Camden Jost – ninth; Junior CDM: Mariah Jost – ninth; Beginner Horticulture Skill-a-thon: Camden Jost – eighth; Junior Horticulture Skill-a-thon: Taylor Lindsey – 15th; Beginner Livestock Skill-a-thon: Camden Jost – fourth; Senior Livestock Skill-a-thon: Aaron Linke – seventh overall, sixth, sixth; Nathan Linke – fifth overall, eighth, seventh; Senior Livestock Judging: Aaron Linke – 15th overall; Jonathan Linke – 10th overall, eighth, third. Purple on Public Presentations at State Fair: Xavier Baysinger, Aaron Linke, Jonathan Linke, Megan Linke and Nathan Linke. Purple Fashion Revue at State Fair: Alexis Kelly. The Sanborn County 4-H Academic Scholarship: Elliott Ohlrogge, who is attending Mitchell Technical Institute this year. The 4-H Key Award Medal is the most prestigious award a 4-H member may receive. Receiving this special award was Jonathan Linke. The following 4-H members are graduates from the Sanborn County 4-H Program this year: Tate Ziebart, Jenna Skinner, Jonathan Linke, Elliott Ohlrogge, Jarid Bechen, Ashley Schmit, Morgan Selland, Austin Ball, April Farmer. Gold Seals were presented to the clubs who have achieved the following goals: 1.) A standard 4-H Club with five or more members; 2.) Holds at least six meetings in a year; 3.) All members show results of project accomplishment; 4.) Club members present demonstrations or talks and do judging on the local club level; and 5.) Have at least 75 percent of the members qualify for a participation certificate. Clubs receiving gold seals were the TL Rangers, Town ‘N Kountry Kids Blue Group, Town ‘N Kountry Kids Red Group and Union Farmhands. Also recognized for their hard work and dedication were the Warren Pals ‘N Gals and Shooting Sports. Callers who participated in the Sanborn County 4-H Phonathon: Rex Schlicht, Taylor Lindsey, Taryn Ziebart, Tristan Ziebart, Nathan Linke, Erica Howard, Tate Ziebart, Kelsey Kotas, Jonathan Linke, Megan Linke, Aaron Linke, Shaun Snedeker, Ty Ziebart and Nick Snedeker. The following individuals were recognized for their years of service to the 4-H program: five years – Lisa Snedeker and Brooke King; 15 years – Art Kneen. MYAH GOES for a kill during Saturday’s Consolation Championship game. Myah Selland has spent the last four years, since she was a seventh grader, making a name for herself on the basketball court, but her talents don’t stop there. Selland is now looking on towards her fifth season as a force on the Blackhawks’ varsity basketball squad, yet spent last weekend turning heads and breaking a record at state level volleyball. On the Blackhawks’ very first trip to the state tournament, Selland scored 73 kills in just 11 sets, averaging 6.64 kills per set. This 6-foot-2 junior’s stat is a No. 2 all-time Class B tournament record. Selland was named to the Class B All-Tournament Team, and was recently an easy pick for the 281 and CBH All-Conference first teams. Myah is the daughter of Brett and Kelly Selland of Letcher.